Generations of my family have played The Drawing Game. Any family get-together is a good time to play. The game involves drawing a small picture at the top of a strip of paper. The paper then passes to the person next to you. She or he writes a description. Folds the paper to conceal the drawing. Passes it to the next person, who draws what the caption describes. The process is repeated until all the strips of paper are full. It’s actually a lot more fun than I’ve made it sound. My problem with The Drawing Game is I’m really bad at drawing. So bad that after a couple of rounds of captioning my pictures over Christmas a few years back, one of my children was driven to write one of Mum’s rubbish drawings under a particularly hopeless effort. The person it passed to was understandably nonplussed. Undeterred, a couple of years ago I thought I’d get in touch with my artistic side. Or at least find out if I had one. Friends assured me that anyone can draw. I bought a sketch pad. Pencils. A large rubber. I decided to start with a feather I’d found in the garden. I’d not got much beyond the outline of the quill when the phone rang. 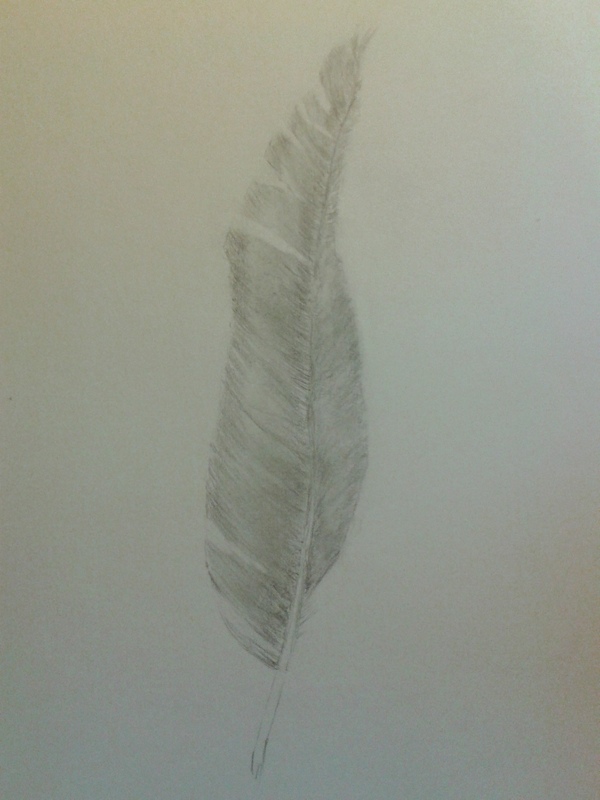 Forty-five minutes later I put my pencil down beside a passable picture of a feather. My friend had described step-by-step how to draw it. I’d followed his instructions to the letter. Now that’s what I call talent. Not my drawing. His teaching. To get me from one of mum’s rubbish drawings to a recognisable feather. In forty-five minutes. Without being able to see what I was doing. It was nothing short of genius. The trouble is this particular genius has a strong preference for large amounts of vodka. Cue head shaking. Finger wagging. Chronic alcoholism’s a pretty effective strategy for not using your talent. It’s far from the only one. The world is full of wasted talent. I’ve met a brilliant artist collating statistics at a dusty desk. Musicians flipping burgers in MacDonald’s. Poets pushing pallets in warehouses. An economist in a pub kitchen. A property manager on the checkout in Tesco’s. We live in a society that ignores inconvenient talent. In the pursuit of feeding the economic sausage machine. Our education system doesn’t help. It values only one kind of ability. If you happen to have it, fine. If your genius is for art. Construction. Drama. Sewing. Welding. Baking. Motor mechanics. Caring. Hairdressing. Music. Plumbing. Writing. Anything creative. Practical. People-centred. Likelihood is you’ll emerge from school feeling pretty useless. One afternoon a frustrated English teacher asked me to take a dyslexic student out of class and listen to him read. A fruitless exercise if ever there was one. After the third tortured sentence of the utterly inappropriate book he looked up. I couldn’t see the point either. I asked what he’d rather be doing. He explained in detail how to strip down the engine of a car. My knowledge of the infernal confusion engine is zero. My interest is less. His enthusiasm caught me and carried me along. Pure genius. A few weeks later he walked out of school for the last time. Someone had called him ‘pathetic’. Again. The last straw. We found him a placement with a local mechanic. His boss told me a few weeks later he was the most naturally-talented apprentice he’d ever had. I’ll never understand why we want everyone to be the same. Square pegs hammered into round holes. So many children are not considered ‘academic’. Don’t connect with conventional education. They often sense at an early stage that they’re failures. That the talents they possess are not so highly-prized as the one they don’t appear to have. That they are less valuable than their peers. I’m fairly certain Albert Einstein wasn’t responsible for the aphorism attributed to him. Everybody is a genius. But if you judge a fish by its ability to climb a tree, it will live its whole life believing it is stupid. But whoever came up with it hit the nail firmly on the head. Why do we want our children to grow up believing they are stupid? Our current passion for targets and league tables exacerbates the situation. To the point of madness. This week’s Secret Teacher in the Guardian suggests that parents of children with non-academic talents are being pressured into moving their children out of ‘successful’ schools. Simply in order that those schools can maintain their position in the league table. I’m a lost cause. An idealist. An ageing hippie. I cling to the outdated principle that human potential matters more than money. The wild belief that education should enable children to develop that potential. Not squash them into boxes. Line them up with arbitrary economic expectations. I suspect a lot of teachers feel the same. Why else would you go into teaching? I have this revolutionary belief that you and I are more than units of production. That we’re here to explore. To learn. To develop our gifts and abilities. To value ourselves and others. Not to spend our lives striving to be what someone else expects. I know. Told you I was a hopeless case. In another life I told frustrated students the problem wasn’t them. It was the system. “If education was about artistic talent I’d have special needs,” I said.